Industrial Internet developers will want to see this GE Predix guide in action. Find out how to configure Predix to aggregate time series data. Software has begun to influence our day-to-day lives. Each day, we are using some sort of software, like switching on a TV, locking our cars, switching on our air conditioners, all using remote controls. We are connecting devices to devices daily, and I had not even thought about this connectivity until I started working on GE Predix. These activities fall into the category of IoT, which is about human interaction with objects. With this technology, devices can alert users when certain events or situations occur. GE Predix deals with IIoT (Industrial Internet of Things), which differs greatly from IoT. The focus is not on connecting small devices but rather on connecting industrial assets, such as jet engines, turbines and locomotives to the cloud and each other in a meaningful way. Think about a situation where we are able to identify well in advance that an industrial asset is about to stop working, enabling us to take actions before it affects our business. Predix is the world’s first industrial Internet platform that connects machines, intelligence, and people. Predix Machine: The software layer responsible for communicating with industrial assets and Predix Cloud. Predix Connectivity: Applicable in situations where direct internet connection is not available. The machine can talk to the cloud through a virtual network. Predix Cloud: A secure cloud infrastructure where data from different sensors and devices can be stored and/or processed. Predix Services: Predix provides industrial services that developers can use to build, test and run industrial internet applications. Predix Machine provides secure cloud connectivity to industrial assets and manages them. Developers can develop their own Predix machine with the help of the Predix Machine Software Development Kit (SDK). The Predix Machine SDK can be added as a plugin in Eclipse IDE, and Predix Machine can be generated by selecting individual bundles or by selecting certain feature groups where all necessary bundles needed for that feature will be included automatically. The Predix machine SDK can be downloaded as a ZIP from https://artifactory.predix.io, for which a valid Predix user account is needed. docs: contains the SDK documentation. eclipse-plugins: used when the SDK is added to Eclipse as a plugin. edgesdk: contains the SDK in various languages, which helps write applications to communicate with devices through the data bus. samples: contains sample applications that help in understanding the various Predix Machine facilities. utilities: contains utility scripts that help in generating Predix Machine containers without installing the SDK as a plugin in Eclipse. InstallationGuide: The Predix Machine SDK installation guide. appdata: can be used by all services as free space for reading and writing files. bin: holds the script to start and stop Predix Machine. configuration: holds various configuration files needed for bundles in Predix Machine. Installations: The Yeti process monitors this folder for software to install. bundles: holds a set of bundles (JAR files). If any custom bundle needs to be created for running in Predix Machine, it should be added to this folder. security: security policies and keystores. utilities: contains the script for starting Docker container. yeti: Yeti is a process that should be started when using provisioning bundles from Proximetry for installing new software. The ZIP to install is configured under Device Management and downloaded and placed in the “installations” folder. This will be unzipped and Yeti will run any install.sh or install.bat inside the ZIP. One of the main components of the Predix Machine SDK is Machine Gateway Service, which provides management of machine adapters in a centralized way. Its architecture is extensible so that developers can develop their own custom adapters for real-time data streaming. Predix Machine already has custom adapters for MQTT, Modbus, OPC-UA and health monitoring. 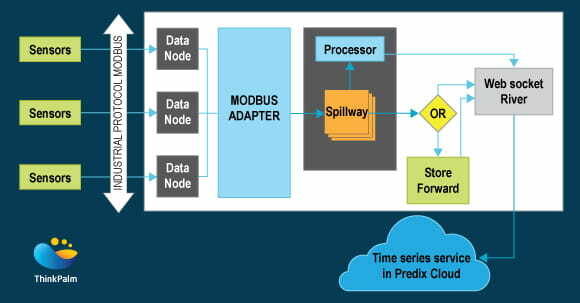 Let’s review how Predix Mchine sends data to the cloud from sensors. To know how Predix Machine sends data to cloud, an understanding of the following components is necessary. Data Node: Machine data is received in Data Nodes. Adapter: The Component that acquires data from sensors through different protocols like Modbus. 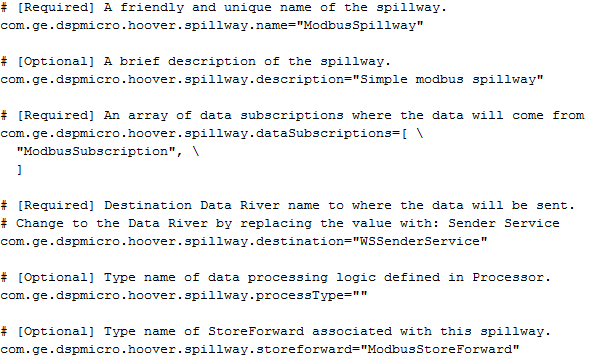 Hoover Spillway: Specifies which machine adapter data subscriptions are to be released. Processor: If a customized logic needs to be injected or if the data needs to be aggregated or filtered, it can be done in processor. Store and Forward: Used to store data temporarily in FIFO order in case the destination is not reachable. The data is stored in an encrypted H2 file based database. River: Component to send data to a destination such as time series database in cloud or MQTT broker. Let’s take an example – how Modbus data is sent to the cloud from sensors. Coil (Discrete Output): 1-bit registers, may be read or written. Discrete Input: 1-bit registers used as inputs and may only be read. Input Register: 16-bit registers used for input and may only be read. Holding Register: Most universal 16-bit registers and may be read or written. It’s up to the manufacturer to decide whether a particular device includes all these register types. Like most protocols, Modbus uses a client/server type protocol. The client sends a request to the server, and the server sends back a response with the requested data or an acknowledgment. A Modbus message may also include a Unit ID, a number between 0 and 255 used to identify the server in networks. Predix Machine is flexible enough that the data can be sent by modifying configuration files only (no coding is required). For reading data from Modbus, there is already an adapter available: the Predix-Modbus Adapter. This is added as a bundle in Predix Machine under the machine/bundles folder. The configuration for Modbus Adapter can be found under configuration/machine. When Predix Machine starts, the bundle will be activated and started, and it will read com.ge.dspmicro.machineadapter.modbus-0.config file. Given below is the content of a sample config file. In the config file, we can specify the XML file to be read for Modbus configuration, a logical name and description for the Adapter, thread pool size to handle subscriptions, and the maximum retries for connecting to a node if it fails while connecting. Given below is the content of com.ge.dspmicro.machineadapter.modbus-0.xml file. This configuration is used to read data from ModbusTCP. The above XML file is the configuration to read data from two registers (with addresses 10 and 11) from a ModbusTCP running in localhost (127.0.0.1), port 502. Each register is represented as a Data Node. The data in holding Register Address 10 is of data type double, and it holds latitude information. Likewise, all Data Nodes that need to be read can be configured in the ‘dataNodeConfig’ section. The nodes that need to be subscribed to can be given in ‘dataSubscriptionConfig’ section. In the above sample, the nodes given in ‘ModbusSubscription’ will start after 10 minutes from bundle start (startPointOffset is given as 10 minutes) and it will be read every 1 minute (updateInterval is given as 60 seconds). This subscription needs to be specified in the spillway config file (configuration/machine/com.ge.dspmicro.hoover.spillway-0.config). The storeforward name given in the spillway config needs to be specified in the storeforward config file (configuration/machine/ com.ge.dspmicro.storeforward-0.config). The storeforward config files also hold information like username and password for H2 (used by Predix internally to temporarily store data) and more. This will be added by Predix internally without assistance. The spillway destination specified in the spillway config needs to be specified in the websocket river config (configuration/machine/com.ge.dspmicro.websocketriver.send-0.config). In the websocketriver config file, we should also specify the URL of the time series service, the Predix zone ID, and its value. (We will get these values from the free time series service provided by GE in the Predix cloud. An account needs to be created in https://predix.io/ and subscribed to the time series service). You should be authenticated in Predix Cloud and the username and password details need to be given in the identity config file (configuration/machine/ com.ge.dspmicro.predixcloud.identity.config). We will get the UAA (User Account and Authentication) URL from the Predix Cloud UAA service. You can query the time series data using a Time Series Query in the Predix Tool Kit (https://predix-toolkit.run.aws-usw02-pr.ice.predix.io/). In short, data will be read from various Modbus sensors using Modbus Adapter. It will be sent to the Predix time series through the spillway and websocket river. If data needs to be stored temporarily, a StoreForward can be configured. Processor, an optional component, can be added for data aggregation or manipulation. We will be able to send the data to Predix time series only when it is authenticated successfully through UAA. Published at DZone with permission of Rajeswari Menon . See the original article here.